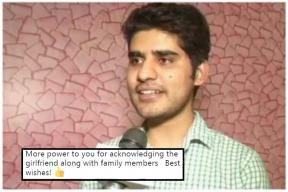 Kanishak Kataria a (UPSC) topper India is going a many progressive ways one live example has come when 2019’s Union public services Commission (UPSC) Topper Kanishak Kataria he thank full for his girlfriend and for his Parents and sister for his grateful achievements. Kanishak Kataria is a B.tech Graduate from IIT Bombay on Friday it was announced as the topper of the country-wide UPSC civil services examination on Friday. “it is surprising to see he mention his girlfriend time is changing, I was punished by my father 3 days before my 10th Board Exam after that he get a letter she has sent me through her younger brother which is hidden in a book. He has written a response to the incident. It is not a first time that the girlfriend and boyfriend of a UPSC topper have in the news. The first couple topper form 2015, UPSC, had been dating Jammu and Kashmir’s Athar Aamir UI Shafi Khan who came in second rank after Dabi in the examinations and then they get married in April 2018.